greggcestaro.com I am pleased to announce the start of something cool and I am very thankful to be a part of doing the PhotoDesign for this new film by Dallas Burgess Through My Daughters Eyes with Avi Lake and a great cast! Joint Concept Productions is pleased to announce the development of its first full length feature film, “Through My Daughter’s Eyes”! We enter the life of Abigail Matthews as she deals with the struggles of her father’s deployment to Iraq and its aftermath. This is a different, and ever important perspective of the effects of war and a story that is all too real. Abbie becomes the voice for all of the military children out there who have faced these challenges…and still do. 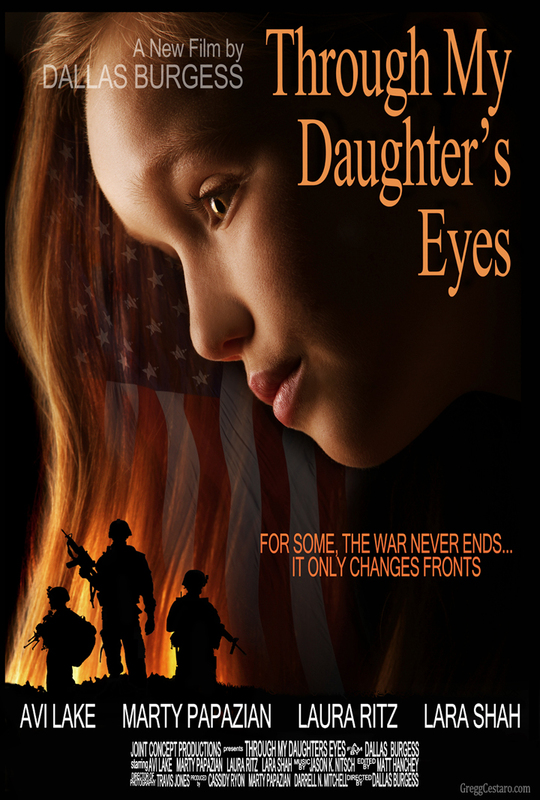 Please like the Through my Daughters Eyes page and stayed tuned for updates as the project moves into production. This shot was done in studio on a black background. I used one 800ws flash light with medium size softbox umbrella on the ground pointing up, and had the actress bend sharply at the hip and lean over the light to draw the hair down, and rotate angled the camera for vertical aspect with a 200mm lens. Later in post-production, I shot the flag with ripple corresponding to wavy hair and liquified it to fit and adjusted opacity to 30 percent. I then got some images of soldiers from my airsoft days and added helmets and other accoutrements and arranged them in a meaningful way. I then drew them as an outline and blacked them in and placed them above the hair which I had dodged highlights and increased saturation to give the flame affect. I think it was fortunate, that the interesting transition from fire soldiers to Avi’s hair with flag creates the tension that this new film chronicles. This entry was posted in Advertising Design, Art, commercial, editorial, FASHION, Model Photography, Photo Design and tagged Camera hints, Fashion Models, Fashion Photography, Fine Art, Graphic Design, Hair and Make-up, Runway Model. Bookmark the permalink.